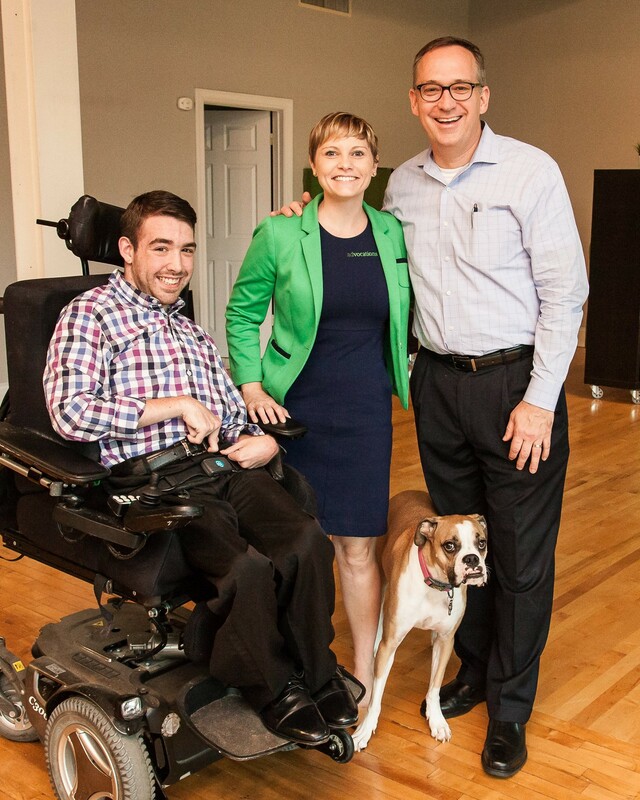 Lindsey Haaser, Lindsey is a social entrepreneur focused on elevating the status of people with disabilities through work and founder of Advocations. The path to a fulfilling career can be full of hurdles and is often especially challenging for people with disabilities. According to University of New Hampshire (UNH) research and federal labor statistics, people with disabilities make up only 3.2 percent of U.S. workers ages 16-64. This is due in large part to misconceptions about the workforce among employers and means a vast majority of people with disabilities aren’t employed. For far too long, we’ve relied on iteration, not innovation, to increase economic opportunities for all people with disabilities. And with the unemployment rate higher today than at the passage of the Americans with Disabilities Act, it’s time to think differently about disability. In 2008, I was working as a certified rehabilitation counselor when I saw a business opportunity in the midst of a global financial crisis. Even though jobs were vanishing, companies still had work to do, and they turned to contingent labor. To meet this need, I started Advocations, LLC., one of the first disability-only staffing and recruiting firms in the country. A recent survey conducted by UNH found that only 27 percent of supervisors have partnered with a disability organization to recruit workers, even though most viewed the idea as feasible. In my journey as a young entrepreneur, I was unsurprisingly met with challenges along the way, but with the amazing help from SCORE, mentors to America’s small businesses, I refined my business model and blazed a trail we could take to help others. At Advocations, we provide talent acquisition and consulting services for employers, as well as career coaching and performance management for job-seekers with disabilities. We’ve trained more than 10,000 hiring managers, recruiters and other stakeholders on disability awareness. And we’ve seen some success along the way. One person that we helped excels at repetitive, methodical tasks and types 132 words per minute – more than triple the average speed – with near-perfect accuracy. With our guidance, he found a career in data entry. What’s more impressive is another client of Advocations that is currently employed as a quality assurance manager at a bank. She has an exceptional ability to identify patterns – by spotting a discrepancy in a pattern of numbers, she saved her company $100,000. Now, we’re thinking outside of the box to expand our reach and increase access to information and resources for employees and their prospective workforce. With the launch of Notable, a game-changing cloud-based platform that empowers people with disabilities to build their own network while gamifying the process of getting a job to build confidence and enhance skills, our vision is to close the gap for people with disabilities by transforming “not” “able” into notable. By making disability something worth talking about, we’re harnessing the proven power of social accountability, cognitive dissonance and transparency to offset bias and produce measurable results in the hiring, retention and promotion of talent. In an industry where the average turnover rate is a whopping 383 percent, Advocations is proud to boast a turnover rate of just 8 percent. Our world is divided by difference, but disability is what makes us all the same. It’s a natural part of the human condition that disability will happen to you. Empathy is a key driver in making disability inclusion work, and it transforms disability from a personal deficit to a shared social responsibility, where people stop settling for “I can’t” and start asking “how might we.” Empathy starts with a conversation, and the conversation starts with you. Lindsey is a social entrepreneur focused on elevating the status of people with disabilities through work. As a Certified Rehabilitation Counselor, she set out to change the way companies source, hire, train, and retain talent with disabilities and launched Advocations at age 25. By designing and implementing innovative and sustainable workforce solutions, she helps companies engage a diverse talent pool while strategically minimizing the vocational impact of disability.